Located in western Connecticut, Woodbury was a popular small sporting facility for over half a century. Woodbury ski area likely dates back to the 1963-64 season when it opened as Tapawingo ski area. Opened by Kermit Adams and Thomas Brownell, initial offerings likely included a T-Bar, a rope tow, snowmaking, and night skiing. A second rope tow may have been added during the mid 1960s. Tapawingo found itself in financial trouble in the early 1970s. While presenting ski films at Nonnewaug High School in Woodbury in 1972, West Hartford native and former US Ski Team member Rod Taylor was asked by locals if he could help save the ski area. Taylor and Chris Ashe took over the ski area for the 1972-73 season with the intention of making it a year round facility. As such, they renamed it Woodbury Ski and Racquet Club. A new Hall double chairlift was installed for the 1976-77 season. Tragedy hit in May of 1980, when the lodge burned down. Taylor rallied nonetheless, adding a new rope tow and leasing property for cross country skiing for the 1980-81 season. A new lodge was constructed soon thereafter. Snowmaking was added to cross country ski terrain for the 1986-87 season. Meanwhile, Taylor made headlines during the mid and late 1980s as he competed and medaled in Masters ski races throughout the world. Using money from his father's inheritance, Taylor boosted snowmaking capabilities, allowing Woodbury to cover its slopes when the surrounding areas were bare. 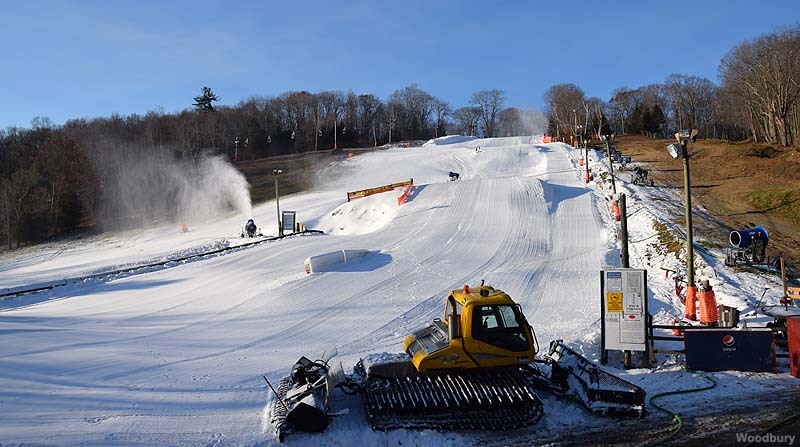 Woodbury made regional headlines in the 2000s on multiple occasions for being the first ski area in New England to open for the season. Owner Rod Taylor passed away unexpectedly on July 5, 2014, two days before his 71st birthday. While all summer recreational activities at Woodbury were temporarily suspended, the area was able to reopen for the 2014-15 season. Dealing with a drought and an uncertain future, Woodbury did not open for the 2016-17 season. Though there was hope the area would rebound in 2017, the 2017-18 season was cancelled that fall. As of December 2017, Woodbury is for sale. "I learned how to ski on the Tapawingo Mountain somewhere around 64-65. My father was one of the tow rope operators. My mother and I rode up on a T-bar, got to the top, she pushed me down the hill and skied away! Halfway down I fell, lost one of my ski's, and she's down at the bottom of the hill yelling "get up, get up!" LOL. Needless to say, I never did acquire much of a taste for downhill skiing. Now, all those Reggae and other concerts that happened in the 70's-80?? There was same darn good times. Rod got in some amazing artists and I never saw one bad show there! Always a fabulous party indeed. :) Heard recently there is someone working on getting the old ski area back in some kind of operation..... "
" I learned to ski at Woodberry ski and racquet in 1970 Rod Taylor was my childhood hero , Lots of race programs and lessons. I remember he would spend a day or two setting up a giant jump on the top of the knoll. Then he would get up his courage after about an hour or so and hit the jump ,usually doing a backflip, of course he would crash horribly ,lay there for about an hour moaning and groaning , he would eventually get up and ski away. Us kids just standing there in amazement . I ended up becoming a ski instructor working in Vermont and Jackson hole Wyoming for years .good memories of Rod Taylor. A life well lived. " "Learned to ski from age 6 (1964)here.Sunshine Set was name of ski school run by Mr Rigby and Mrs Benson.Skied there thru 1985.Wonderful memories,night skiing 4 nights a week,Rod taylor tried to make a go of it.Did a good job adding snow cat,better martin thycol snow making ,concerts ,saw Earl Scruggs& Vassar Clemons,Brewer and Shipley,Arlo Guthrie ,Phish..then turned to reggae,Yellowman,Steel Pulse,Black Uhuru ect....Rod sold me his Dynamic VR 17's undrilled from 1968,amazing ski's still saved them for posterity"
"Skied there on weekend trips 1964 to 1968....with other families from Long Island. H a picture climbing upt to the T Bar.Went to Westover School in Middlebury CT 1967 to 1969.After College ...went to Aspen COfor one winter. Stayed for 42 years..Started and operated SnowPuppies Ski School at Aspen Highlands for 3to 6 year olds from 1965 to 2000, when spenSki Company took over and took over all previously owned independent businesses.Still teach children to ski at Snowmass Ski Area. ...aspenCO.Nice to know that Tapawingo. (Woodbury Ski Area) is still operating.L"